While some thousand fans were en route from Pennsylvania, New York and New Jersey heading to the Trump Taj Mahal Casino Friday evening for an event advertised as 'Dinner with Shah Rukh Khan', little did they know that the object of their affections was lagging behind them, through no fault of his own. At 11pm, just as crowds were growing restless from the 90 minutes of opening songs and stand-up comedy, Khan took to the stage amid screams of 'I Love You' from young girls. After the usual niceties about being happy to be back in Atlantic City, he let on to audience members the unwelcome welcome he received upon touching down at Newark Liberty Airport on Friday night. "I'm sorry if I made you wait but I had a few issues at the airport," he said. "I was stopped and questioned for a couple of hours. It's a big drag because they kept telling me my name is very common, and I kept telling them, my name is Shah Rukh. I've never even met anyone whose name is Shah Rukh. Later, I realised that were pissed off because I'm Khan." The actor said no more about the experience, quickly switching over to chat about his other travel woe, the fact that his bags were delayed on British Airways. He then joked about how he'd had an offer of a loan of underwear from one of the show's organisers. 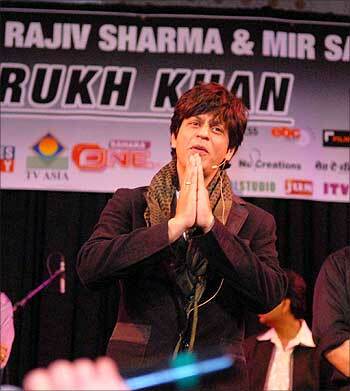 Khan may not have let on to the audience if he was angry or hurt by the experience, but in the one hour he was on stage in the Trump Casino Ballroom, word spread in India, with everyone from Information Minister Ambika Soni to Khan's close friend Karan Johar expressing their reactions. Ironically, Johar's 2010 release My Name is Khan has the Badshah playing Rizvan Khan, a man with the Asperger's symdrome -- a condition which affects social skills and the ability to read human emotion -- and is detained in Los Angeles because he has a Muslim name. Shah Rukh Khan is expected to continue his US travel where he is scheduled to make another meet-and-greet appearance in Houston on Sunday.